DVD Review: Revisiting "Paris, Texas"
1984 was a great year for foreign-language and independent cinema in the U.S. Off the top of my head I can recall seeing the following at Chicago’s Fine Arts Theater, sadly defunct by the turn of the century: the Coen Brothers’ debut, Blood Simple; Jonathan Demme’s Stop Making Sense and Rob Reiner’s This is Spinal Tap; Jim Jarmusch’s Stranger Than Paradise; Alan Rudolph’s Choose Me; Giorgio Moroder’s take on Metropolis; Ingmar Bergman’s Fanny and Alexander; Bertrand Tavernier’s A Sunday in the Country. Not to mention Wim Wenders’ Palme d’Or winner at Cannes, Paris, Texas which as its title suggests is a mix of both strains, an English-language film made by German and French talent in the American Southwest. But I didn’t much care for Paris, Texas. In fact I remember getting into arguments about it. A typically thorough and insightful Criterion Collection DVD has made me see the error of my ways, but it also confirmed that I was right the first time. 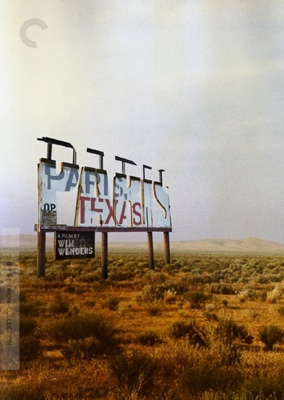 While there is a Paris, Texas the film, written by Sam Shepard, never gets to it. (So any arthouse adventurer planning a pilgrimage is missing the point.) A photograph of a vacant lot there is one of the few possessions owned by the ragged, non-communicative Travis (Harry Dean Stanton), who has spent four years wandering the dust-dry desert of Big Bend, TX. Intriguingly, Wenders intended for Shepard to play the part, but the scribe and sometime actor was right to decline in favor of Stanton, a familiar face (fresh from the earlier cult sensation Repo Man) never more haunting than here. Travis is retrieved from his meandering by his concerned brother, Walt (Dean Stockwell, another actor trailing a long resume through mainstream and fringe productions), who piles him in his car and returns him to Los Angeles. It’s this first, enigmatic section of the film that people most remember, for two reasons besides the silent Stanton. One is the masterful photography by Robby Müller, not just the sun-blasted landscapes but the sinuous way his camera negotiates tight space in vehicles (a constant in the film, as Wenders notes in his commentary) and found locations like arid hotel rooms. The other is Ry Cooder’s amazing slide guitar score, with a title track based on Blind Willie Johnson’s “Dark Was the Night (Cold Was the Ground).” Once heard, never forgotten. I played my tape of the soundtrack until it wore out. The third part, where a reinvigorated Travis heads to Houston to locate his wife Jane (Nastassja Kinski, blonde, Southern-accented, and more touching than I recalled), is where I got lost on the road. Back then the 145-minute film slowed to a crawl as Travis found Jane at a strange peepshow-type parlor, where the women sit behind windows in themed vignettes (coffeeshop, oceanside, etc.) and talk to the men via phone. The two scenes between the play-acting couple, who can’t see each other, go on at length, and I yearned to be outside again (and wondered what Hunter, who had come along on the trip, was doing unattended). The metaphor for alienation, or disconnection, or ennui, or whatever, felt overblown, and rigidly “European” and arty after the open-minded fascination with America typical of Wenders’ work. I still don’t think it succeeds and my first, negative impression counts. But thanks to Wenders I now understand how it’s supposed to work, as two one-act plays inserted into the narrative, deliberately packing the movie into those airless rooms. The ending, which Wenders wrestled with, restores a measure of breathing space.